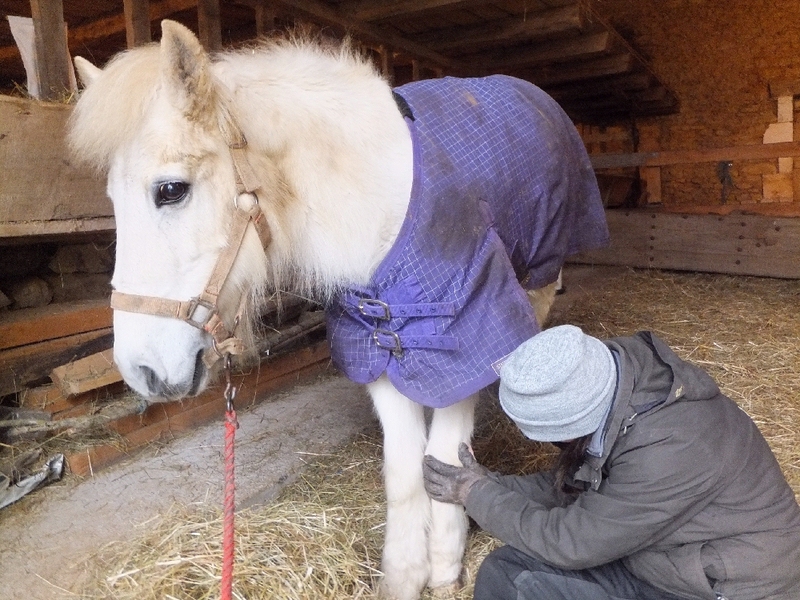 Misty was rescued by an animal rescue association in France after being found in a field where she had apparently spent three years, unable to move because of laminitis and the consequent deformation of her feet, surviving on the grass that grew within her reach. After her rescue, inches of excess hoof were removed, and she became comfortable enough to be rehomed. After 18 happy months in her new home where she went from hardly being able to walk to getting around with her new friends with little or no pain relief, she started to become less mobile. In December 2014 The Laminitis Site was contacted and asked whether there was any chance of Misty’s condition improving - if there wasn’t, it was felt she should be put to sleep. 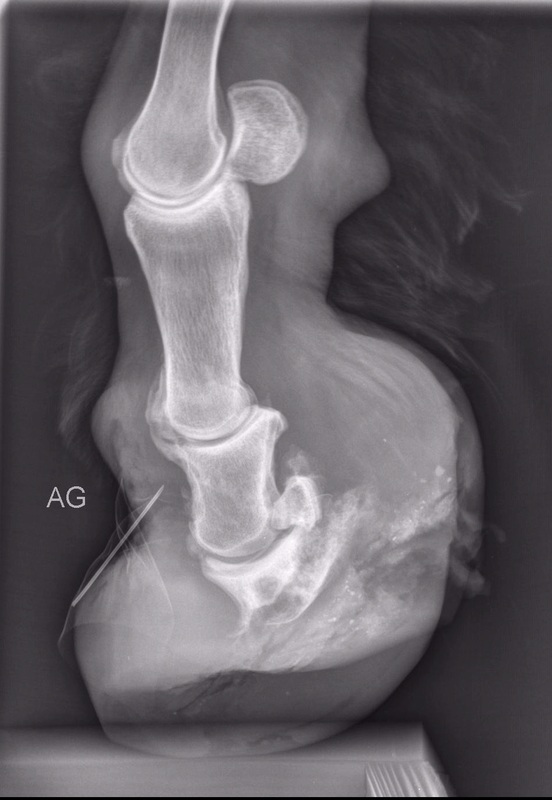 Despite regular trimming her front feet were still very deformed, with toes too long, heels that from the solar surface looked like two cliffs either side of an almost non-existent and infected frog - urgent treatment for thrush was suggested. The left fore was very twisted and she walked on the inside of the foot. Her back feet were long, also had infected frogs and were not able to provide the support she clearly needed for her front feet. She crossed her front legs over each other and seemed happy to stand like this. She was surprisingly willing to pick her feet up. 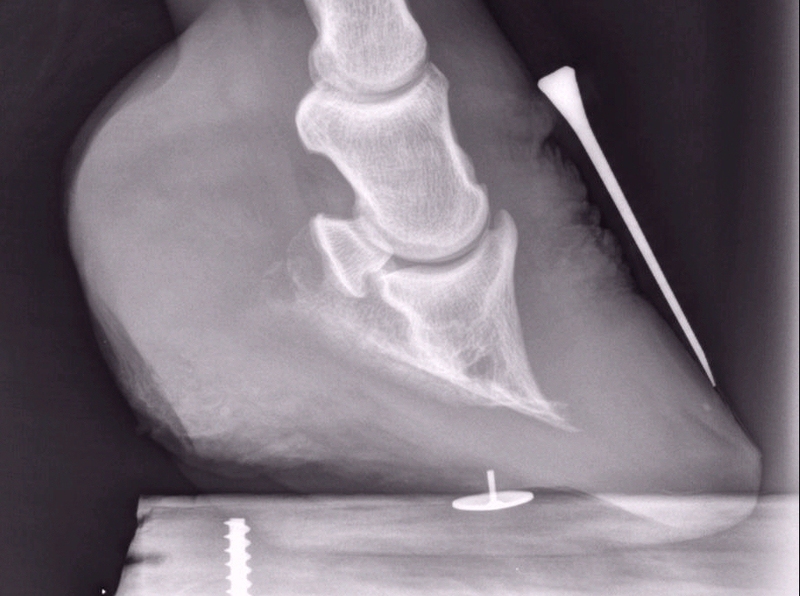 There were few reliable markers on her feet - trimming without x-rays would not be advisable. She had a long shaggy coat perhaps suggesting PPID, although she had had a summer coat. Not surprisingly she walked with a very odd gait, with her back end seeming disconnected from the front, but that said, on soft ground she moved with surprising speed and no hint of reluctance. Her general demeanour was bright with pony determination, she had a good appetite and was passing nice healthy piles of dung! As far as we knew, Misty had never had her feet x-rayed - trimming had been based on guesswork to date. 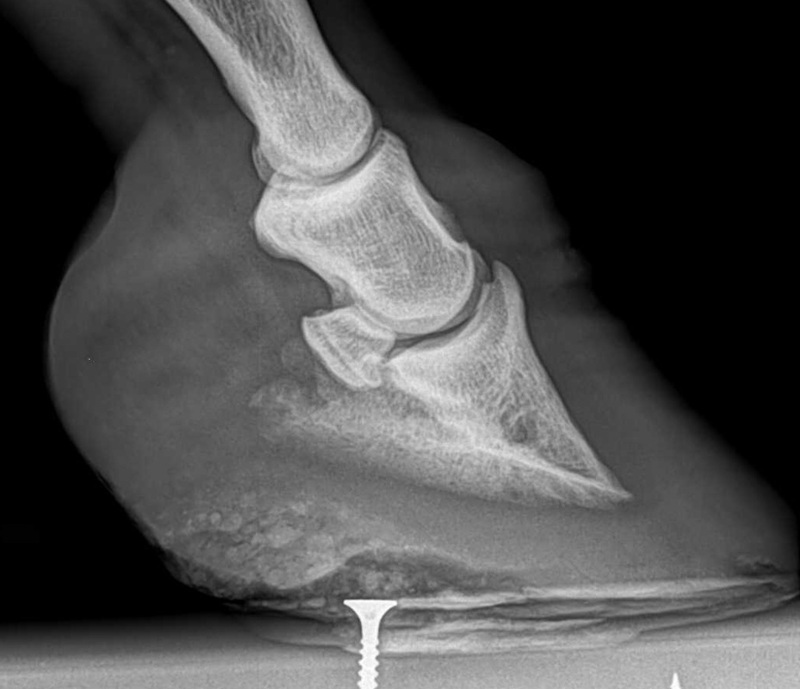 This is not fair on the farrier, or Misty - x-rays are essential after laminitis, particularly when the damage has been as severe as in Misty's case. However, her owner, whilst providing an excellent caring home, did not have funds available for the x-rays and blood tests needed. 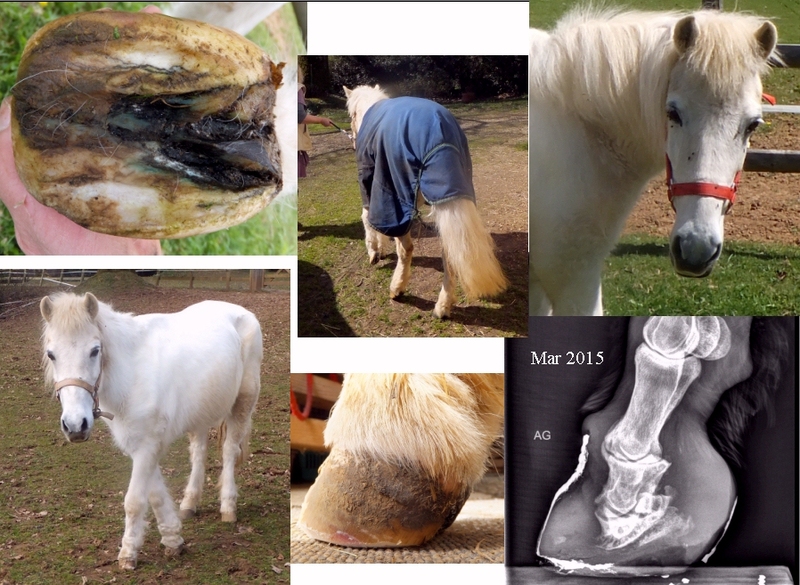 In December 2014 The Laminitis Site launched a campaign to raise funds to pay for Misty's care, particularly for x-rays so that Misty's feet could be trimmed for optimum alignment of hoof to pedal bone, to assess the amount of permanent damage, and so that a plan for her future care could be set out based on facts, not guesswork. 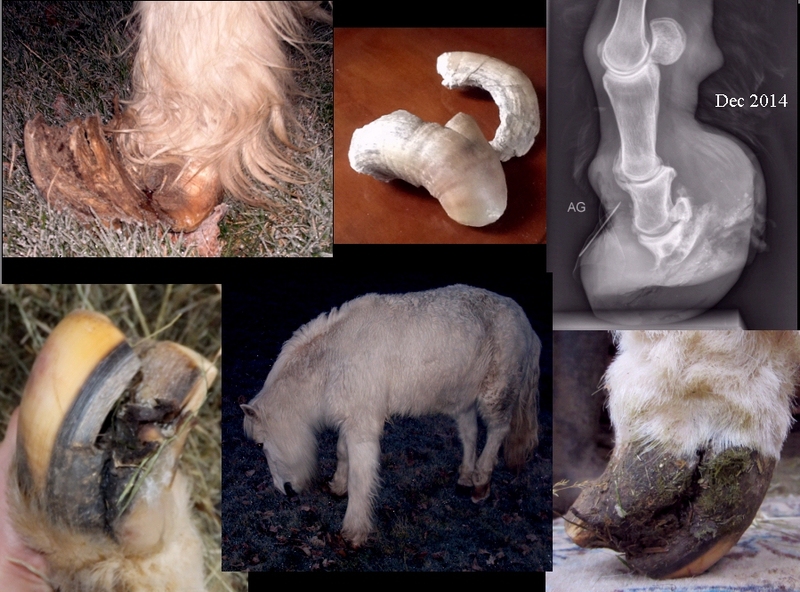 Some of the hoof that was removed when Misty was rescued. X-rays were taken of both front feet on 16 December. As Misty's feet were so deformed, we decided that a lateromedial view of each foot would be enough to start with. The x-rays showed horrific damage - extensive loss of the pedal bones, calcification of other bones (arthritis) and (we suspect) ligaments, unnatural joint alignment, a thick laminar wedge extending past the extensor process, very high palmar angles - about the only thing she had going for her was reasonable sole depth - and there was definitely room for improvement. We're still trying to work out what this sort of damage means in terms of blood supply to the feet and nerve loss/damage. We wonder whether osteomyelitis may have contributed to the bone loss. What is truly amazing is that she is as comfortable as she seems to be with feet like this! Trimming Misty's feet is going to be very challenging, as the usual guides of frog, hairline, white line just aren't there. With this extent of damage, rehabilitation is out of the question, the best we can hope for is to make her as comfortable as possible for as long as possible. The initial aim is to give her as large and as stable a weight bearing surface as possible - "a foot to stand on". 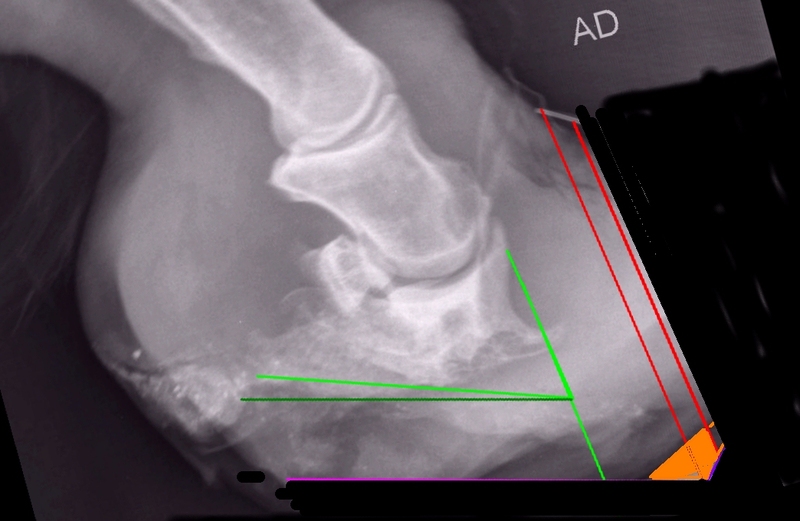 This will involve very slowly lowering her heels, aiming towards restoring the palmar angle to around 5 degrees (indicated by the pink line), but given the length of time her palmar angle has been abnormally high, care must be taken to avoid damaging soft tissues and joints and causing discomfort, and the realignment may not be able to go that far. 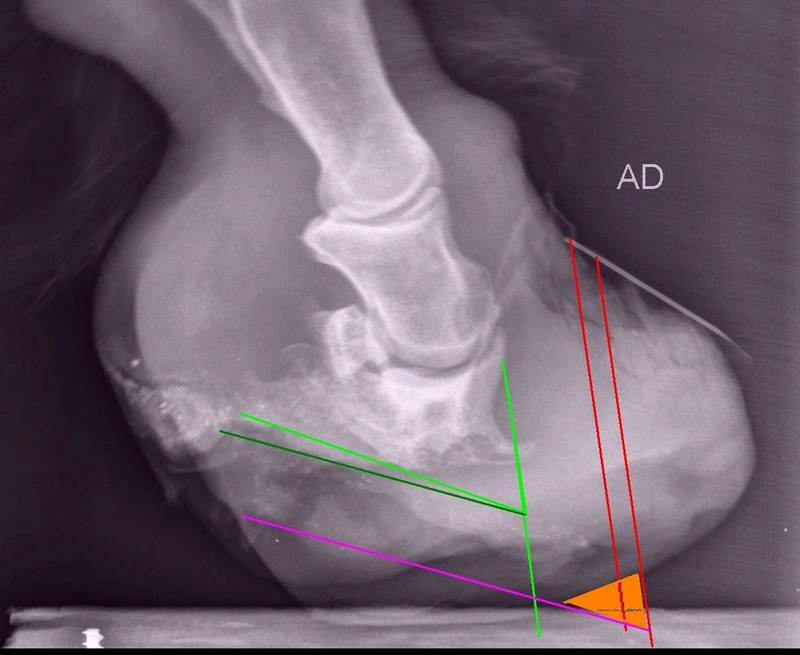 The laminar wedge can be reduced to some extent, but keeping in mind that her feet must be protected, and we don't know exactly what path new hoof growth will take. We're going to have to experiment to find the breakover she is most comfortable with. To a large extent, the trim is going to be guided by Misty's comfort, not by the x-rays or how her feet look or should look. Hopefully realigning trimming will allow her foot to look a little more like it should. 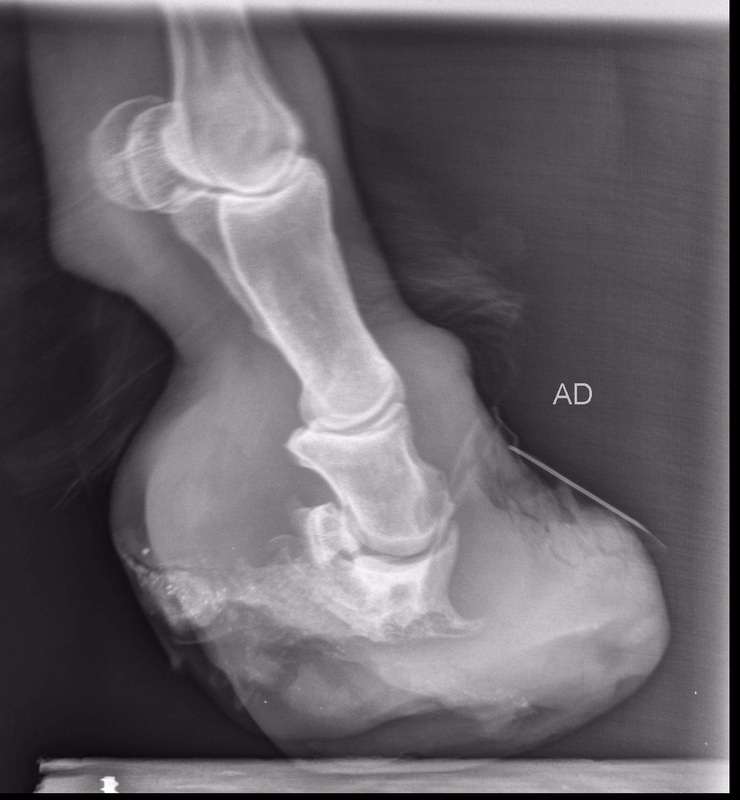 Below: .... and the same foot 4 years later - despite regular trimming the foot had never quite been realigned and the pony had had ongoing laminitis (he was eventually diagnosed with PPID). The dorsal and palmar angles have increased, there is now a significant laminar wedge, significant sinking, and note the start of calcification at the tip of P3. However, this foot is a long way from the damage seen in Misty's feet - just how many years of neglect has Misty suffered to have such extensive damage? Misty's left fore is very deformed and twisted. As with the right fore we are aiming to improve her weight bearing surface and if possible reduce the twist, but all trimming will be guided by Misty's comfort levels and will involve experimentation and taking things very slowly. Misty has already had a couple of small trims and treatments for her thrush, and her owner has since reported "Misty seems to be happier and reverting back to the more cheeky side of her! When she comes in at night there is no resistance like before - once on the flat she walks almost normally, and she seems to be holding herself straighter". Small trims are being carried out every 3-4 days, and next week Misty will start a programme of physical therapy. More x-rays are likely to be needed early next year. Misty had her first TTouch session with Danielle Dibbens at the end of December. Danielle noted that Misty had a roach back, her pelvis was tucked under, her tail low set, and she had a lot of tension in her back end. She often stood with her front legs crossed, but was fairly mobile and walked with little hesitation. She was defensive about having her legs touched. Danielle described Misty as a "coper", and thought that she was happy in herself and not emotionally shut down. Therapy started on her back, pelvis, tail and legs, with Danielle visiting every 2-3 weeks. The thrush in Misty's frogs seems to be clearing up with regular antibiotic spray treatment. 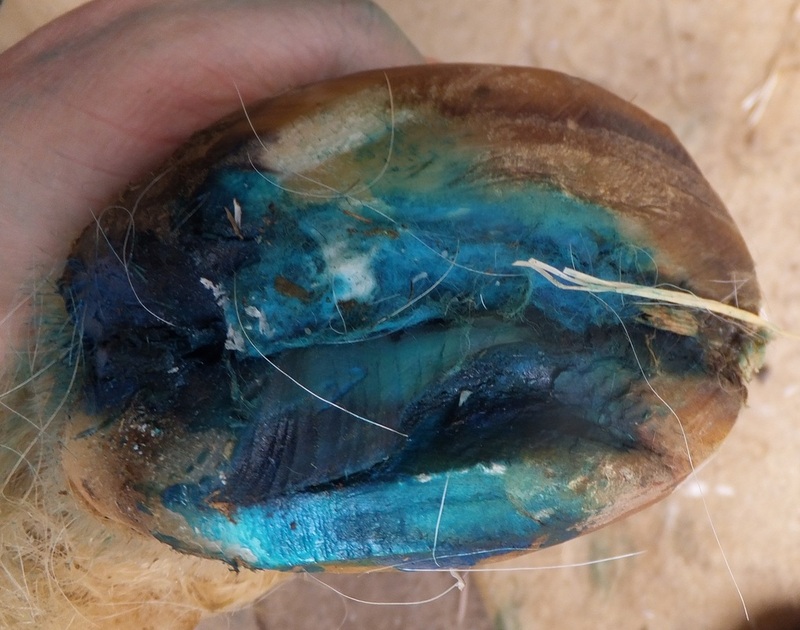 Misty's deep-seated thrush was initially treated with a powder, but after consultation with her vet, this was changed to an antibiotic spray which was easier to get deep into the crevice between her heels. After each trim her feet were sprayed with antibiotic spray and then plugged with cotton wool, which was soaked in the antibiotic spray. EVA pads were tried on her feet, but every time she got them off within a few hours, and they didn't appear to particularly improve her comfort - as long as she was on soft ground, she seemed quite comfortable. It was felt that while her feet were so deformed and likely to change significantly, trying hoof boots should be delayed. Misty is a lovely pony, full of character and affection, with a lot of determination and a strong will to live! She sets herself a strict daily routine, expecting to be let out of her stable by a certain time in the morning, and let back in again at night with her tea ready. She lies down at much the same time every day, asks to go into the paddock with her close friend chestnut gelding Ziggy as long as the ground isn't slippery from rain, isn't at all phased by having chickens laying eggs and dogs and cats playing under her belly, and loves having children around her. Last December I met the bravest and most cheerful pony I have ever known. After years of neglect, resulting in hideously deformed feet from laminitis, with knock-on effects throughout her body, Misty had come through rescue associations to find a wonderful life with Rosemary. TLS was called in as Misty had started to show increased signs of discomfort. Together with TTouch practitioner Danielle and vet Alexandre, we worked on making Misty as comfortable as we could - we knew the damage to her body ruled out a full recovery, but she was clearly so happy and content with her new life, and not showing signs of pain. By the spring her feet were much improved and she was walking quite normally; through the summer and mild autumn Rosemary reported that Misty was trotting, climbing banks, playing with her friends, and exploring every corner of her property. In July Misty started to pass blood in her urine. She showed no signs of illness, and the vet couldn't pinpoint the cause, although a tumour in her urinary system was suspected. Medical treatment appeared to ease the bleeding, and Misty continued to radiate happiness and contentment. Yesterday I saw Misty for a routine visit. Rosemary reported that in the last week or so she had been less active, not finishing all her bucket feed, and the bleeding had returned - she wondered if we were getting near time to let her go. We had always questioned whether, despite our best efforts, she would be happy through another winter. However, Misty was particularly cheerful, obliging to pick up her feet, snuffling for treats, content to have some TTouch on her legs, and our session finished with a lovely cuddle. My lasting impression as I left her was one of peace. Misty slipped away last night, quietly in her stable, with her friend Ziggy next door. ​If you would like to contribute to the funds spent on Misty's rehabilitation and the rehabilitation from laminitis of other horses and ponies in need, donations can be made through Paypal, by cheque or bank transfer. Funds raised don't just help the horse undergoing rehabilitation, but also provide information to assist future rehabilitations for horses around the world.